Splitting 1 ficus bonsai into 2. I had in mind to lower the height of this tree by cutting off the top. This tree originally had 2 aerial roots and I help developed a 3rd one with straw. I fused the thickest aerial root in the middle with zip ties for a year so it will become part of the lower tree after I cut the top off. top was severed and a soil change performed. Unfortunately the fused aerial root was mis-handled and snapped off. Should have protected it before the soil change. This new tree will develop into an aerial root specialist and I might stick a big rock down the middle in a year or 2. Not sure where to find a suitable rock. What's left of the original tree after raising it above the soil line to show more nebari root spread down below. What I still have in mind for this 14 year old tree is just letting it grow out to fill in more. I have since raised the tallest side branch to be the new apex and removed the bare trunk that's sticking out. Pretty sure I will do a thread graft to create the lowest rightward branch just above the soil line on the out side of the bend. I was dissapointed I lost the fused aerial root for the lower tree but hopefully I can develop a new one down the road. Will post progress down the road. I'm open to suggestions. Thanks. I'm sorry I missed this thread. Awesome tree by the way. The area where you made the cut looks as if it was bulging out which to me was reverse taper. I think the decision you made to make the cut where you did was a good one. 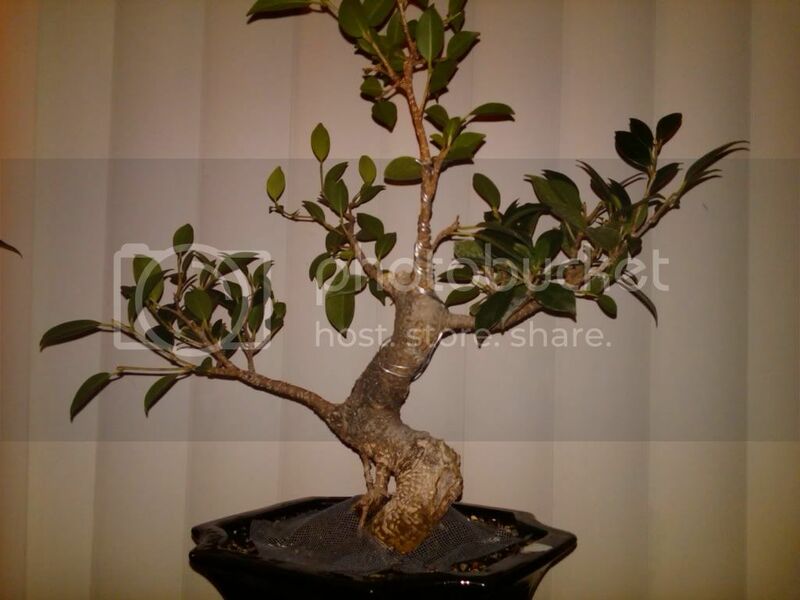 I am Quintin, the one who became inspired, informed, and intrigued by bonsai. But I also like gardening too. Nice job. In time you might want to wire your tree(s). Nice branch placement. They could be wired traditionally or lowered with tie-down (pull-down) techniques. Hey Quint - good to see you coming back to visit us again. Can't offer much in the way of styling. Just my POV, but S trunks just aren't my thing, and I can't look at one and offer advice because, well, nothing can change the S trunk. Intriguedbybonsai wrote: I'm sorry I missed this thread. Awesome tree by the way. The area where you made the cut looks as if it was bulging out which to me was reverse taper. I think the decision you made to make the cut where you did was a good one. What seems to be reverse taper is due to my bad phone picture and the color difference on the trunk. Thanks for looking and I just hope the new tree will generate roots into the black pots soon. TomM wrote: Nice job. In time you might want to wire your tree(s). Nice branch placement. They could be wired traditionally or lowered with tie-down (pull-down) techniques. I do wire them on and off throughout the year the problem is they will perk up toward the ends shortly after removing the wiring. Might have to do tie downs since it won't eat into the bark like wiring does. kdodds wrote: Can't offer much in the way of styling. Just my POV, but S trunks just aren't my thing, and I can't look at one and offer advice because, well, nothing can change the S trunk. I don't blame you on the S styling. When I got it from Pathmart 2 years ago for $11 it was already grown and trained like that. I'm training my current trees to emphasize short and fat tunk with lowest branches as close to the soil line as possible because in the future I will pull up the tree higher over the years to expose roots. I have a few with fused trunks too. Eventhough these trees are cheap, they sure propagate fast and are alot of fun to work with for me at least. Hi Tom. I'm still around. I just found a new place in which to talk about bonsai with more serious enthusiasts. Not that there aren't any serious people here, it's just that it's not as active as it could be. The "S" trunk, or the "spiral" trunks are just not a natural representation of nature. Though only you can be the judge on that. I still like the tree for what it is. Does it have a good nebari spread going on? If not, I suggest maybe a larger pot for root development. I don't disagree. What it does have is some root spreads under neath and I intend to expose them after a while since I just changed the soil on this tree and pulled it up higher. You'd also notice this isn't just a simple S trunk, it has 2 aero roots or branches that grows straight into ground which makes things more interesting. Would'v liked to keep that long aerial root that starts up high. This tree was well trained before I got it so I don't mind people bashing it at all so go right ahead and point out any other faults you see. The size of this tree for me is big enough and it's done growing. The aerials do make it a little more interesting. I hope you don't take what I said as bashing, because you could throw up any S trunk any I'd think the same thing, which is why I disqualify myself from advice. The only thing I could fathom myself doing with this tree is semi-cascading it. I'd keep the first bend and really rough it up. If I could get upward growth from it, I'd take it and make it look like the main trunk broke off. I'd keep the lowest side branch as the new leader and lose the whole top of the tree. go ahead and bash I don't take it personal it's an $11 tree for cat sakes. I want your critical comments and ideas. Interesting semi cascading idea, I didn't envision that on this tree. What would you do with the top that's cut off, garbage? In a way it's good to start with this S shape because you can chop and change the design to suit your vision many different ways. I'd keep the left and right lowest branches, leave the vertical as the leader and toss the rest. The bends aren't as drastic up there, and will be even less so as it grows out. Is this what you meant? I wired it like this the other day. I could have chosen the back leftward branch as the new leader but it looked a bit wierd in the paint program . . .
Yup. The back left would be left, right, right, etc. If you do it, I'd do it as an air-layer. Hey this is a big improvement from what it did look like. I really do like this! The new apex is right on. I apologize if it seemed like I was bashing before. I believe that is just how the bonsai community is in general. What I've learned when I began getting into bonsai is that it is a very critical artform, and everyone has their own vision/method of what they want a certain tree to look like. You have to style it "your way". If it looks good to you then so be it. My only suggestion, as mentioned before, would be to plant it in a larger pot when the time is right. My Ficus Bonsai needs help!